Travis Watkins came to us in 2011. He was practicing in Oklahoma, and has since expanded to Texas and Arkansas! What we did: Travis has been featured on a number of news programs. We added badges in the header of his site to display the news networks he’s been involved with and programs he’s been seen on. Why does it work? The media badges establish Travis’s credibility. When media outlets are looking for an authoritative voice to speak on a breaking news subject, they seek out attorneys who have experience. Travis shows he is capable of speaking clearly and decisively on important news topics, and this engages a wider audience. Being featured on the news also commands respect! What we did: Featured a “Why Choose Travis Watkins?” button in the header. Why does it work? Tax attorneys are not rare, and Travis knows this. By providing a side-by-side comparison of his services and the “other guys’” services, users can get a better feel for why Travis is the best choice. What we did: Travis has a talk radio show on Sundays, so we added a module to his website where users can listen in. Why does it work? Because we provide an archive of recordings, potential clients gain the opportunity to hear what Travis has to say, which builds credibility. Prospective client bond well when meeting with an attorney if they are primed to feel comfortable and trusting. 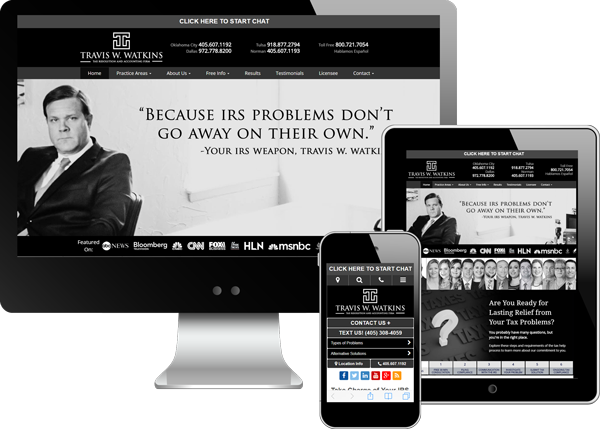 The talk radio module on his website gives Travis the opportunity to speak directly to his audience before they even meet with him, giving prospective clients the chance to “get to know” who he is before they make a decision about hiring him as their attorney. What we did: High-quality, authoritative content is shared on Travis’s website using in-depth articles, blogs, FAQs, and free books. Why does it work? Many people facing issues with taxes and the IRS don’t believe they’re in a financial position to hire an attorney. By creating tons of educational and informational content, Travis can not only provide the answers his potential clients are looking for, but he can prove to them that hiring an attorney is affordable and desirable. Without having these resources, many of his prospective clients would not know where to go or what to do about their financial issues. The generous sharing of his knowledge positions Travis as someone who knows so much that he can afford to give away help for free, which cements his “good guy” status emotionally and his mastery of specialized skills intellectually.